Floyd Mayweather junior insists he has done nothing wrong after reports emerged that he received intravenous vitamins before his mega fight against Manny Pacquiao in May. Although the ingredients of the injection are not prohibited, most anti-doping agencies ban their use intravenously because the method can be a masking agent for performance enhancing drugs. Mayweather, who has never tested positive in his 19-year professional career, however maintained that he was a clean athlete and would continue to champion the cause. 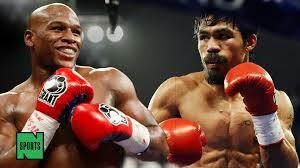 However, Manny Pacquiao had called for punishment and a rematch after discovery. The eight-division world champion, who lost an unanimous decision to Mayweather in Las Vegas, urged Nevada Sports officials to “impose the appropriate sanction” on the unbeaten American. Mayweather and the United States Anti-Doping Agency (USADA) have both insisted the boxer’s actions were legal after it emerged he was injected with vitamins and minerals before the fight. Pacquiao said he was treated unfairly because the Nevada body refused to let him use a USADA-approved painkiller for the fight, when he was carrying a shoulder injury.